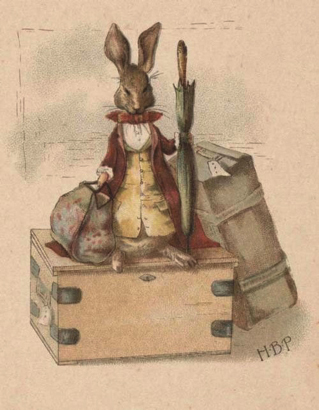 Did you know that our very own library has the largest collection of Beatrix Potter works--imprints, manuscripts, letters and original illustrations--this side of the Atlantic Ocean? We will meet in the Rare Book Department of the Parkway Branch for a tour that begins at 2pm. Our guide will be the Curator of Rare Books who designed the exhibition. The items displayed explain the attraction of Potter's work to so many and also highlights the donors who in some instances spent a lifetime accumulating these books, handwritten documents and works of art. There are personal letters to friends that provide insight into Potter's own thoughts. Please register by calling 215 925 7333 or emailing info@pennsvillage.org. The handicapped accessible entrance is on Wood Street. We thought tea and something sweet would be a nice addition to the afternoon and will meet after at Le Pain Quotidien at 1937 Callowhill Street. There is no charge for the event, although we are always appreciative if those who are not members or volunteers are able to donate $5 to Penn’s Village. We will each cover our own refreshments, but let us know if you are able to join us there, so we can make reservations.